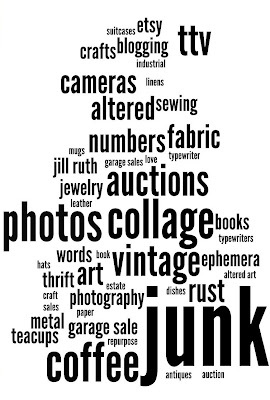 Wordle Word Art - Jill Ruth & Co. I came across this post at Mimi-Toria's Designs blog. I thought it was neat, but wasn't really sure what it was. 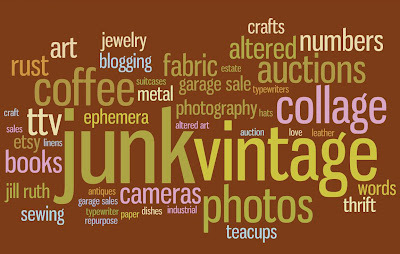 Soooo, I clicked on the picture and it took me to this awesome site called Wordle! Consequently, I just spent the last half hour piddling (kind of a silly word, maybe I should add it to my word collage!) with words and art! Oh, my goodness, it's addicting!! It's somewhat limited, but for me that translates to easier, which is good! It also translates to free, which is even better! My plan is to print one of them out onto transfer paper and make a tote bag. I think I may also make some business cards out of one of them. The site says feel free to do so, just include the website address. I can do that. Tip: (1)make sure you copy your group of words because it isn't saved on the site, if you want to edit or start over. (2)If you want two words or more to stay together, type the ~ sign between them (3) You'll need to take a screen shot of it if you want to save it as a jpeg file on your computer. That looks like a lot of fun! I'm sure I could spend hours there. I didn't know there was transfer paper you could run thru your printer. That sounds really cool. I'd love to see how your project comes out. Hey! I followed Robelyn over to your blog and love it, too! I tried to find the wordle site but came up with ads instead. If you have a minute, post the direct link! Now, I'm off to raid my stash of vintage fabric, ric rac and partially made scarves so I can make one like you made. LOVE IT!!! I'll be back! Love it!!! Thanks for sharing going to wordle now!!! That is a cool idea. I didn't get it at first til I saw your name up there.DUH! I'll have to remember that one. Would make a cool gift for friends. Thanks for stopping over. I agree ppl take there decorations down way too early! Oh, I'm so delighted you enjoyed it. Thought it was a cool site when I stumbled upon it a few weeks back. 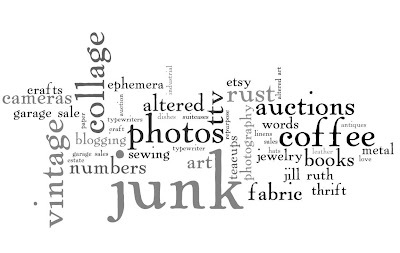 Would be a blast to make wordle art for gifts for people too. Enjoy! Thanks for stopping by my site. I love this! I'm going to have to go and check it out. Love the word "piddle" it makes me laugh. Have a wonderful Happy New Year!